Photo courtesy of Doug Paul. Three Sisters Vineyards. Photo by Jason T. Barker. 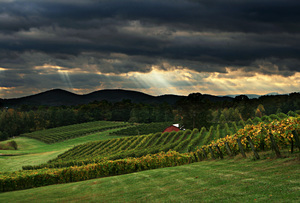 The Dahlonega Plateau Wine Trail offers a unique day trip or weekend for wine lovers. Different from a restaurant, come to the source where grape meets glass! Three Sisters Vineyards - Dahlonega, GA, just an hour and fifteen north of metro Atlanta celebrates with the annual Wine & Chocolate LOVERS weekends all month long. 100% Estate Georgia Grown red and white wines paired with award winning local artisan chocolates are combined into a tasting line-up and includes keepsake wineglass. Newly released Georgia Cuveé sparkling wines will also be offered. Perfect for couples and small groups for walk-ups. Larger groups should call for reservation details. Pricing starting at $20 per person or $40 per couple. Every Saturday 11-5 and Sundays 1-5 (Perfect for after brunch on Sunday!) in February in case you want to celebrate sooner or after Valentine's Day weekend.